These are a delicious cookie from last year (from my best-loved recipe magazine for Taste of Home). 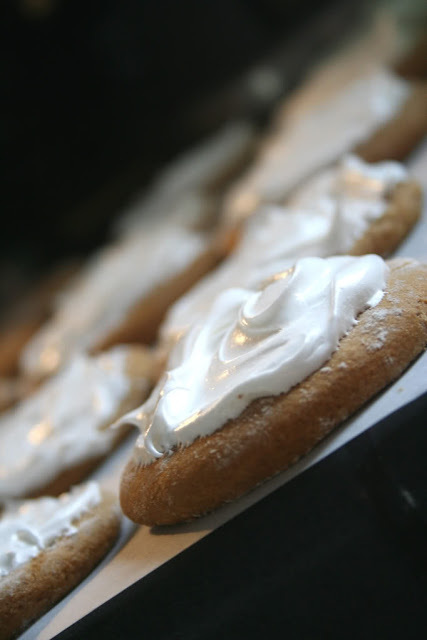 Light and airy texture for a cookie with a unique and delicious flavor; can't beat that. Because of the egg whites in the frosting, they stay nice, even through a stay in the freezer. They also stack nicely without ruining their looks. In large bowl, cream the butter and sugar until light and fluffy. Beat in the egg yolks, molasses, and water. Combine the dry ingredients separately and then add gradually to the wet mixture. Cover and refrigerate for two hours, or until easy to handle. On a lightly floured surface, roll out dough to 1/8-inch thickness and cut with floured rounded cookie cutters (about 2 1/2 inches). Place one inch apart on ungreased cookie sheet; Bake at 375 degrees for 8-10 minutes or until the cookies are firm around the edges. For the frosting, combine the sugar, egg whites, and water in s small saucepan an cook over low heat. With a hand mixer, beat on low speed for one minute. Continue beating over low heat until the temperature of the frosting reaches 160 degrees (this should be close to 8-10 minutes). Pour into the bowl of a heavy mixer and add the confectioners' sugar. Beat on high until the frosting forms stiff peaks. Frost cooled cookies and let stand until frosting is hard. These look absolutely delicious. I'm doing a cookie exchange this week. I might use this.